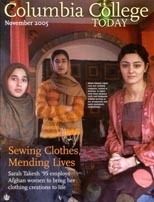 Clothing designer Sarah Takesh ’95 employs Afghan women in her Kabul workshop, creating beautiful apparel while empowering her employees. Bert Kleinman ’63 heads the Middle East Broadcasting Network, a radio and TV campaign to reflect “the best of American values” in Arabic broadcasting. Two former Lion athletes, Fernando Perez ’05 and Jessen Grant ’04, are making their mark in minor league baseball while they aim for the majors.